Correct posture, alignment, balance, stance shoulder width apart are a few of the tools you'll want to practice on the range first. Playing a golf hole successfully starts with a well-executed tee shot. But ensuring success off the tee isn’t as simple as hitting a 300-yard drive in the fairway. It starts with a fundamentally-sound alignment, grip and stance. When playing a dogleg, a golfer may have to play a slight draw or fade shot, which makes understanding the proper stance critical to hitting a driver successfully. When using a driver, setting your feet properly is the first step to a correct stance. Approach the ball and stand with your feet about shoulder width apart and your body weight evenly distributed on each foot. Align your body to play the ball off the heel of your left foot (right-handers) or the heel of your left foot (left-handers). This will ensure the ball is hit slightly on the upswing, providing more distance and helping the ball get airborne. Practice this alignment on the driving range; moving the ball an inch or two forward or back in the stance can greatly change the results. Hold the driver with a relaxed grip. A relaxed grip lets the club turn over easily in your hands. If you hold a driver with a strong grip, it generally means you are trying to swing too hard, which can cost distance and accuracy off the tee. It is important to be aligned “square” to the target. This means the feet and shoulders are parallel to the target line. To check your alignment, place a golf club on the ground along your toes. Leave the club on the ground and walk behind the ball to check that you are aimed correctly. If a right-handed golfer is playing a hole that doglegs to the left, a draw may be necessary. 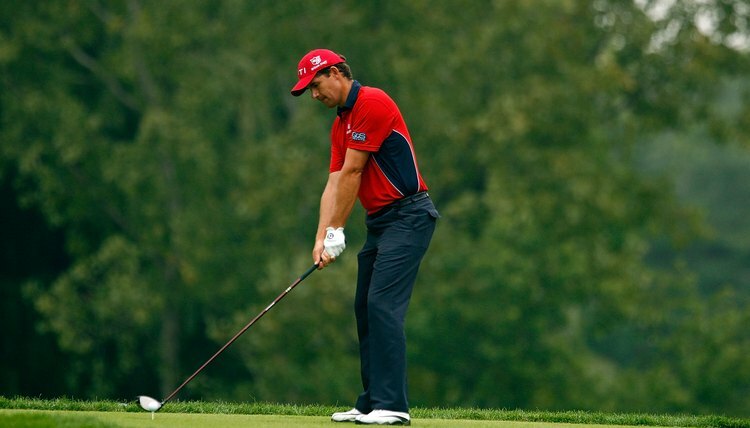 To set up for a draw, stand with your feet slightly wider than normal and play the ball back slightly in your stance. Align your body as though you are hitting slightly to the right of the target and swing along your body line. Reverse these instructions if you are a left-hander. If a right-handed golfer plays a hole that doglegs right, he may need to hit a fade. To align for a fade, take your normal stance, but aim slightly left of the target. Practicing this alignment on the driving range is important in finding the correct angle for your golf swing. After aligning your feet, aim your club directly at the target and take your normal swing. This should cause the ball to fade.